For this year’s Thanksgiving dessert, I wanted to stray away from the usual apple or pecan pie. I wanted to make something low in calories and slightly healthier, so I made Blueberry Cookie Crumb Bars (without butter!). 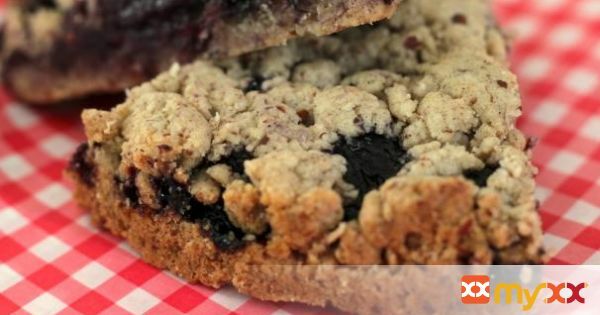 These blueberry cookie crumb bars are super easy to make and will disappear quickly. Since the bars are low in calories, I felt less guilty gobbling them up with some vanilla ice cream!! :) To make this recipe, you'll need a 7″ Round Pan with Removable Bottom or 6″ Square pan with Removable Bottom. Come to http://mamaloli.com for details and pics! 1. Preheat oven to 350 degrees F. Line pan with parchment paper or use baking spray. 2. Mix the cake flour, almond meal, cinnamon, and sugar together in a large bowl. 3. Add canola oil and form a pasty dough. Separate the dough with your hands to form crumbs. 4. Add Maple syrup and form into a dough once more. 5. Separate the dough into 2 pieces. 6. Crumble and press 1 of the pieces of dough into bottom of the pan. 7. Add the frozen blueberries. 8. Crumble the remaining dough for the top layer. 9. Gently press down and bake for 45 minutes at 350 degrees F.
10. Let it cool down for about 30 minutes. Cut into bars and serve.